Tourism is a growing industry all over the world. Korea is no exception. More internationally oriented people, the emergence of low cost airlines, popularity of Internet sites directly selling flight tickets, and new interest in emerging markets all contribute to the growth in tourism. As travel becomes increasingly accessible the demand for tourism will continue to grow. Good news is, there is growing interest in Korea and if the nation meets this demand and makes the best out of its resources, it can see incredible growth. 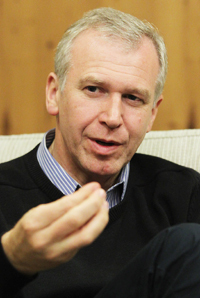 Yves Leterme, deputy secretary-general of the Organization for Economic Cooperation and Development (OECD), said Sunday that Korea has good prospects for tourism. He is visiting Korea to preside over the 90th OECD Tourism Committee meeting which kicked off its two-day run on Monday in Muju, North Jeolla Province. “Korea is a wonderful, marvelous country. I want to come back privately just to see more of the country. You’re very lucky to be Korean,” he said during an interview with The Korea Times. “Korea is one of the leading economies in the world in terms of growth and agenda setting and this is beside tourism. In terms of tourism, there’s a variety of beaches and mountains creating great scenery, as well as nice buildings. Its culture and religion are also diverse and interesting,” he said. Korea has lots of possibilities to sell its products, he said. “There is an enormous interest in Korea all over the world. Big events are being organized here in Korea. There are new initiatives to market. There is over-attention for China. But Korea is where the attention can be shifted to,” said Leterme. He said the strength of Korea’s tourism industry was its authenticity and great marketing skills. In terms of marketing, Korea has strengths, he said. Also the quality is improving. “People want the best possible interaction. I went to the museum for insects today and it was world level, I would say. People don’t just want to be here physically. They want to get in touch with the culture. In the field of technology Korea is a world leader and this is an enormous tool,” he said. At this point, Sergio Arzeni, director of Center for Entrepreneurship, SMEs and Local Development at the OECD who was sitting in, chimed in to point out Korea’s creativity. “Korea is moving to creative industries. The Leeum Museum by Samsung is an example. They had three of the most famous architects in the world build the museum. Aesthetic values are becoming a reference,” said Arzeni. What the organization plans to achieve through their biannual meetings is to discuss ways tourism can play a more important role in the whole world economy. “We want to put tourism on the government agenda in the states that we all represent. And the committee gives legitimacy to that work. Our advantage is that we work close to policymakers who are the main actors in their representative states. At the meetings, we exchange our best practices, evaluate, and benchmark each other,” said Leterme. Before joining the OECD, Leterme held various political posts in Belgium at all levels including the minister of foreign affairs and prime minister.